There are not too many people this day in age that stand for pure good and kindness, We at Shanlian on Batman feel that Lenny Robinson was an exception to this rule. 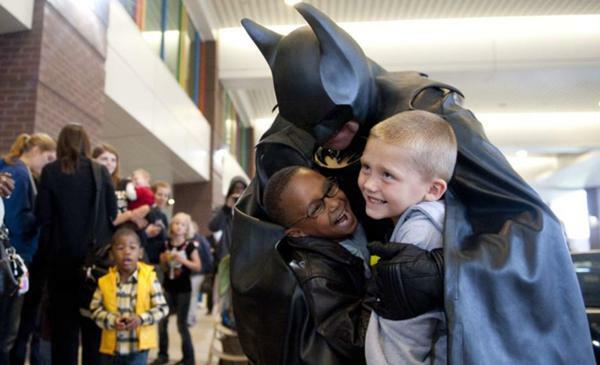 For those of you that do not know of Lenny’s work long story short Robinson had put together an amazing Batman costume, drove a blacked out Ferrari (before purchasing an actual 66 Batmobile), and used his own personal funds to drive from city to city to Children’s Hospitals around the country to give gifts and a spark of hope to sick children. Lenny fist appeared on the internet and gained popularity with the police dash-cam recording of him being pulled over by a Montgomery County police officer while in full Batman attire. Lenny was most unfortunately fatally stuck by a vehicle on I-70 near Hagerstown MD after his Batmobile had reportedly broken down on his way home from a car show in West Virginia on Sunday, August 16, 2015. The fact that this man took the time out of his busy life, funds out of his wallet, combined that with hard work and dedication, all to bring a smile to the faces of unfortunate kids tells us exactly what kind of man Lenny Robinson really was. Reading through comments and message boards full of condolences many people throw out words to describe Kenny, words like Hero, Kind, Loving, Gracious, Generous, Honorable, etc, but the only word that sticks out to me while scrolling through, the only word that makes sense and sums up the impression that Lenny made on this earth is “Batman”. We here at Shanlian on Batman would like to send our condolences to the family and friends of Lenny B. Robinson in these hard times. This entry was posted in News and tagged batman, LennyRobinson, news, tragedy. Bookmark the permalink.